A handful of Svengali-like producers have acted like silent partners in bands that went on to change the course of rock and roll. The Beatles had George Martin, Cream had Felix Papalardi. Iggy pop had David Bowie. 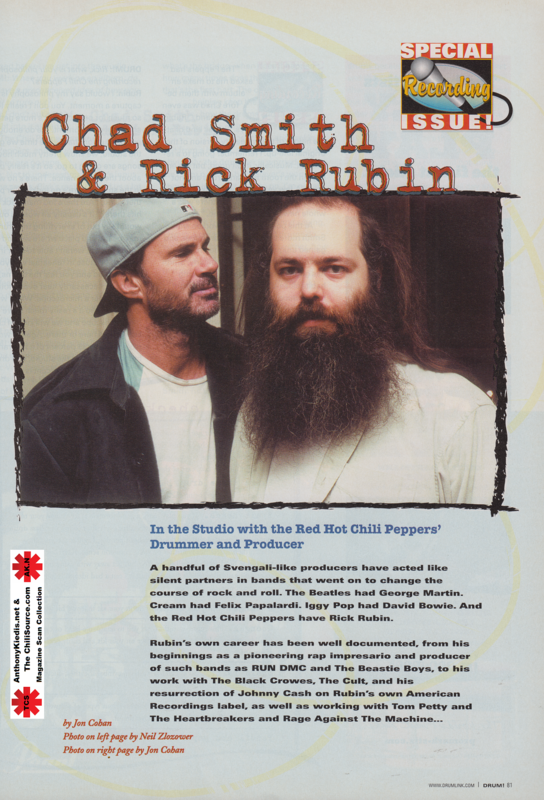 And the Red Hot Chili Peppers have Rick Rubin. 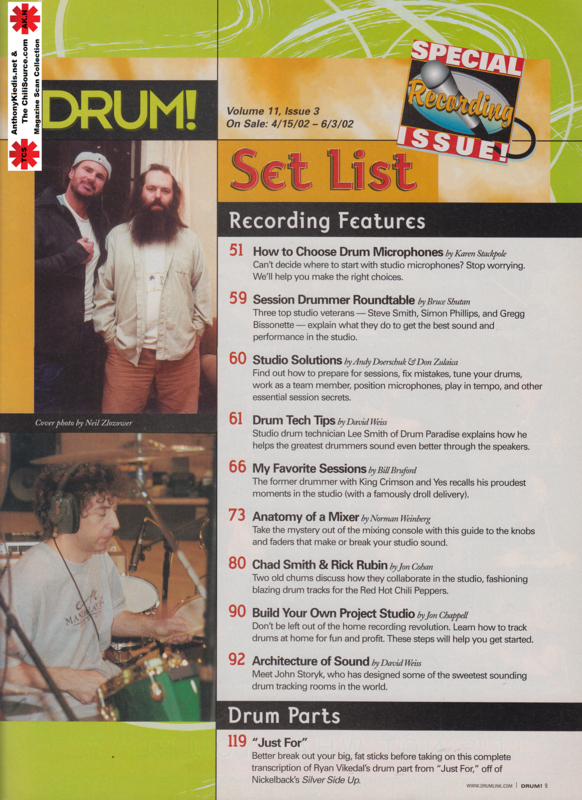 At this point, Rubin has worked with Smith more than any other drummer, and gained unique insight into the process of capturing Smith’s talents. Similarly, Smith has gotten to study Rubin’s producing habits close-up, and has benefited from the producer’s skill. DRUM! got the opportunity to speak with both while the Chili Peppers were in the studio working on the band’s newest release (which was still untitled at press time). DRUM! 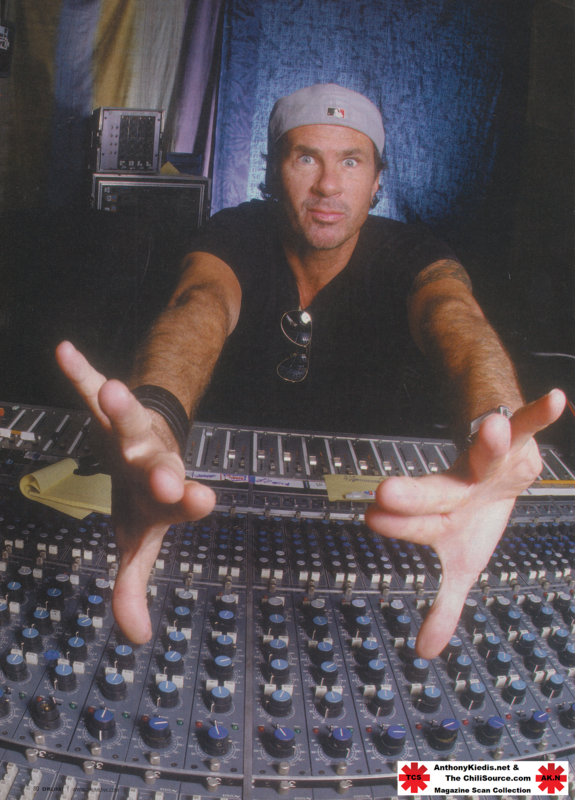 : Rick, what is your philosophy in recording the Chili Peppers? Rubin: I would say my philosophy is to capture a moment. You don’t really look so much for perfection, it’s more getting a snapshot of a moment. We do enough pre-production that by the time we get to the studio, we know pretty much how the songs are going to go, so it’s really only about the performance. There’s no writing in the studio, there’s no looking for parts, there’s no, “Are there too many kick drum hits there?” It’s usually all worked out. I would say out of everything the drums may be the one place where we find things that we weren’t able to hear in rehearsal, because in rehearsal everyone’s playing loud and you feel the drums, but you don’t necessarily hear every note – it’s not under a microscope. When we get into the studio it’s really much more under the microscope and we will kind of change little things here or there. Again, I would say musically 99 percent of it is arranged before we get into the studio, and drumwise 95 percent is arranged before we get into the studio. DRUM! : When you work on an album, do you have a preconceived idea of how you want it to turn out? Rubin: I don’t put a lot of thought into it ahead of time. The Chili Peppers are the Chili Peppers, and my job is to capture who they are on tape. 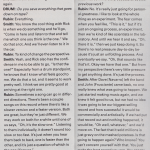 Smith: Not to underestimate Rick’s input into the songs. 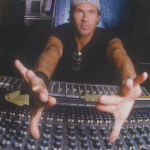 Rick’s really helped us a lot in making our songs the best they can be, whether it’s pre-production or changing things in the studio – that’s his forte. I know he’s helped a lot of bands that way. It’s made us a better band and better musicians and probably better songwriters. 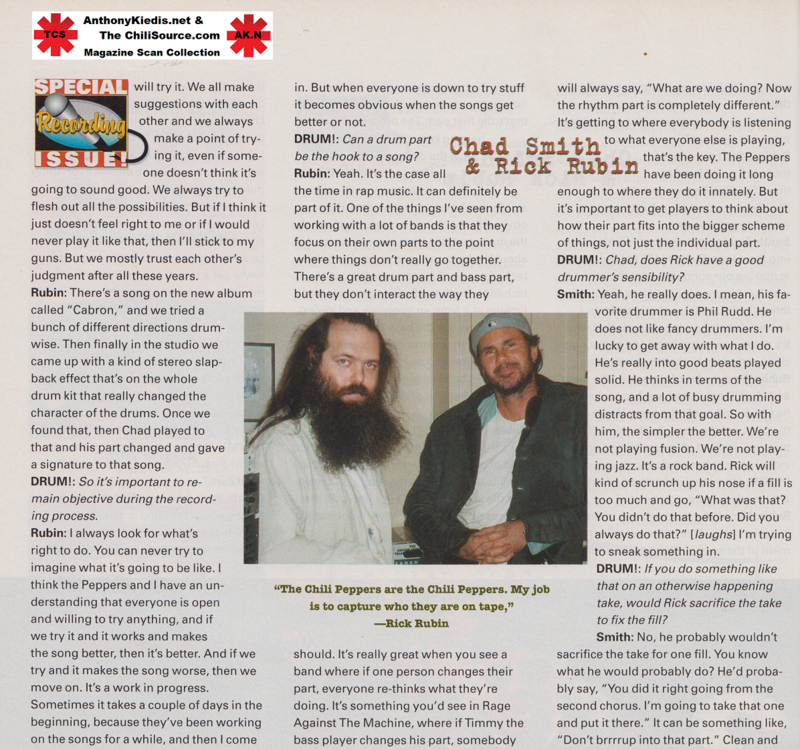 Rubin: We put a lot of stress on “the song” and I feel like the producer has to do what he can do to benefit the song. We’re all at the mercy of the song. By thinking of it that way, instead of concentrating on individual parts, what we do together works. DRUM! 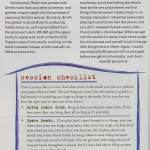 : How involved with Chad’s parts are you during pre-production? DRUM! : What sort of things do you suggest to Chad? 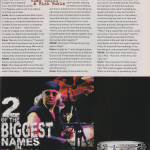 Smith: Rick really concentrates on the drums because they are going down first and they’re not going to change. 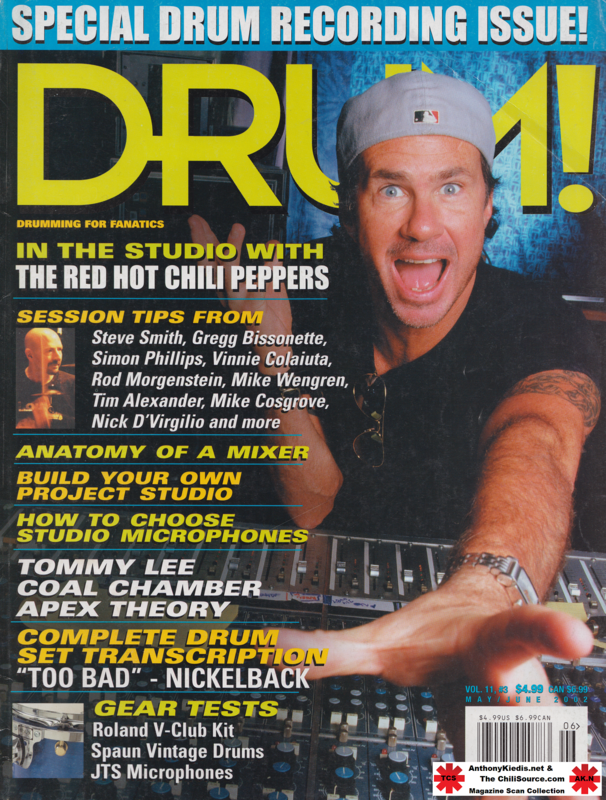 You can change guitar parts, you can change bass, but you’re not going to change drums [after the basic tracks are recorded.] The way we do it is we keep almost everything during basics, so that’s the hard part. Sometimes it gets really frustrating because I just want to play and not think about changing this part or that pattern, so some songs we work on all day and never get a take. It can be frustrating for the other guys too, sitting there, while I’m figuring something out. Rick will go “Yeah, it’s got a good feel, but Chad, could you come in here for a minute?” And I’m like [frustrated scream] and I’ll throw some sticks at the wall. But it makes the song better, and that’s the most important thing. He’s good at hearing things. I’ll acknowledge it, and sometimes I’ll disagree. Smith: Yeah, because I find that my gut feeling about the song is usually pretty right. 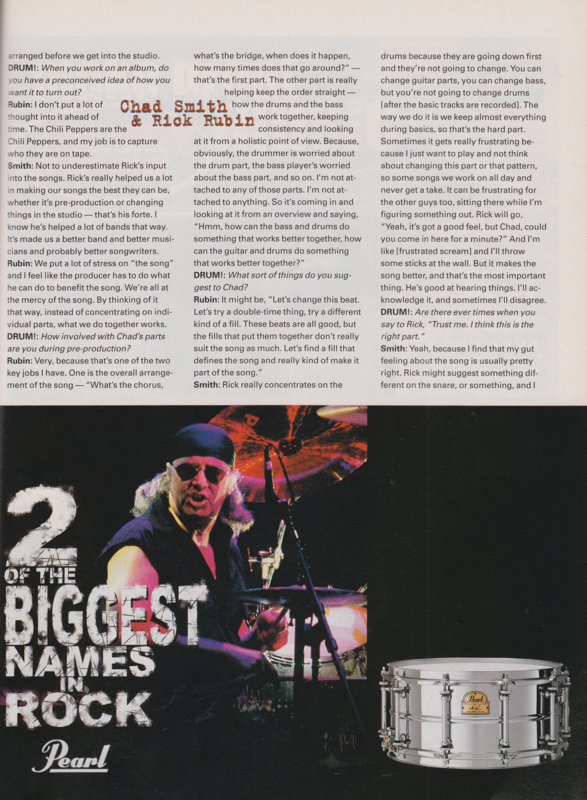 Rick might suggest something different on the snare, or something, and I will try it. We all make suggestions with each other and we always make a point of trying it, even if someone doesn’t think it’s going to sound good. We always try to flesh out all the possibilities. But if I think it just doesn’t feel right to me or if I would never play like that, then I’ll stick to my guns. But we mostly trust each other’s judgment after all these years. 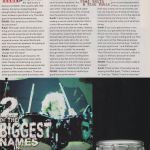 Rubin: There’s a song on the new album called “Cabron,” and we tried a bunch of different directions drumwise. Then finally in the studio we came up with a kind of stereo slapback effect that’s on the whole drum kit that really changed the character of the drums. Once we found that, then Chad played to that and his part changed and gave a signature to that song. DRUM! : So it’s important to remain objective during the recording process. Rubin: I always look for what’s right to do. You can never try to imagine what it’s going to be like. I think the Peppers and I have an understanding that everyone is open and willing to try anything, and if we try it and it works and makes the song better, then it’s better. And if we try and it makes the song worse, then we move on. It’s a work in progress. Sometimes it takes a couple of days in the beginning, because they’ve been working on the songs for a while, and then I come in. But when everyone is down to try stuff it becomes obvious when the songs get better or not. DRUM! : Can a drum part be the hook to a song? Rubin: Yeah. It’s the case all the time in rap music. It can definitely be part of it. One of the things I’ve seen from working with a lot of bands is that they focus on their own parts to the point where things don’t really go together. There’s a great drum part and bass part, but they don’t interact the way they should. It’s really great when you see a band where if one person changes their part, everyone re-thinks what they’re doing. It’s something you’d see in Rage Against the Machine, where if Timmy the bass player changes his part, somebody will always say, “What are we doing? Now the rhythm part is completely different.” It’s getting to where everybody is listening to what everyone else is playing, that’s the key. The Peppers have been doing it long enough to where they do it innately. But it’s important to get players to think about how their part fits into the bigger scheme of things, not just the individual part. DRUM! 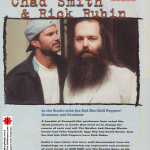 : Chad, does Rick have a good drummer’s sensibility? Smith: Yeah, he really does. I mean, his favorite drummer is Phil Rudd. He does not like fancy drummers. I’m lucky to get away with what I do. He’s really into good beats played solid. He thinks in terms of the song, and a lot of busy drumming distracts from that goal. So with him, the simpler the better. We’re not playing jazz. It’s a rock band. Rick will kind of scrunch up his nose if a fill is too much and go, “what was that? You didn’t do that before. Did you always do that?” [laughs] I’m trying to sneak something in. DRUM! : If you do something like that on an otherwise happening take, would Rick sacrifice the take to fix the fill? Smith: No, he probably wouldn’t sacrifice the take for one fill. You know what he would probably do? He’d probably say, “You did it right going from the second chorus. I’m going to take that one and put it there.” It can be something like, “Don’t brrrrup into that part.” Clean and simple. Sometimes it can be as little as opening a hi-hat too much. He doesn’t like things too washy. But I got to say, it does sound better. He’s usually right. Not always, but we’ve worked together enough where I have trust in his suggestions, at least to give them a try. The other guys in the band are the same way. DRUM! : Rick, what do you think of Chad as a drummer? Rubin: He’s super solid. He can play anything and it sounds really consistent and it really sounds song-like and it’s the backbone. You can’t have a great band without a great drummer. He really fills the job well. You know that whatever he’s going to play is going to sound good. DRUM! : Have you seen Chad’s approach change over the years? Rubin: He’s pretty much the same. He comes in, does good work, stays really solid. The key to Chad being so great is that he really listens to what everyone else is playing. The interaction between the players is what really makes it. There are some guys who are great drummers, who see their role as just to hold it together, or “everyone follow me.” Chad’s not that kind of drummer. He interacts with everybody. It always sounds like a song when he plays. Everybody in the band is really interactive. you can tell the way they look at each other. They stay close and watch what each other is doing. A lot of bands face the audience, even in the studio. Smith: I really have come to appreciate making a record, what a statement that is in your life and what you do. I’m really proud of the music that we make. I always want it to be the best it can be. I don’t want to just get by. Capturing the best feel and the best take of the song at that time is something to really strive for, so in that way you kind of put pressure on yourself. My job is to keep it together and make it sound like us. Luckily I’ve recorded enough where I don’t get the red light fever. I used to. I’m not recording tree sessions a day like some of these guys who are used to it, but with every project you learn more. I think I’m a better player than I was when I started with the band. DRUM! 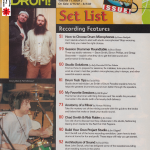 : What is the key to capturing a good drum performance? Rubin: It’s really trying to document what they do the best I can. The difference in all the drummers I work with shows up because I try to capture their essence. I don’t try to give them a sound, but really give my best representation of them, and try to not get in their way. Instead of the drums they use live, we may discuss finding and trying a whole bunch of drums to find the absolute most pristine sounding drums. That’s more just to get the most out of what he’s doing. Smith: If you try to get too fancy or too drummy, you get away from the song. Rick is not one to say, “That needs to be longer.” He’s usually cutting stuff out. He’s pretty good at that. Because we always start out with jams and we’ll go, “Let’s do that part eight times,” and Anthony will come up with stuff that fits that length. Then Rick will come in and cut it, which is rough on Anthony because he’s been working with the rehearsal tapes. DRUM! : How do you know when a take is a keeper? Smith: There’ve been times when we are playing and Rick goes, “That’s it, come on in,” and I go, “Really? I want to hear that.” But that’s the big thing about having that perspective across the glass. Sometimes you know – it feels really good. Rubin: We can all lose perspective, and we have. It’s often good if you’ve been playing [a song] six or seven times in a row, we may say, “Let’s come back tomorrow and see if we got it,” and listen back and learn from those and go back to it again. DRUM! : Do you save everything that goes down on tape? Smith: You know the cool thing with Rick is when we do something and he’ll go, “Come in here and listen to that and tell me which one you think is the one.” We do that a lot. And we’ll even listen to it in the car. Rubin: To kind of change the perspective. Smith: Yeah, and Rick also has the confidence in me to be able to go, “Is that the one?” Especially from a drum standpoint, he knows that I know what feels good to me. We do that a lot, and it seems to work pretty well. I think we are pretty good at arriving at the right one. DRUM! : Has Pro Tools changed the way you make records? Rubin: It really hasn’t changed things that much for me. The only thing it makes fast are things like comping. Like if we do vocals and do something ten times, it makes it faster to pick the best take and try it all different ways. Before when we were doing everything on tape it was much slower. But we don’t really use it in the ways other people do. We use it just as a way to facilitate things that we would normally cut tape with. It gives you more choices and you can hear it right then. 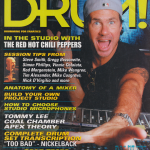 With Pro Tools, you can make drums sound right, but you can’t make it feel good. All you can do is take two bars that sounded good and put them together. Smith: I think it takes a lot of life out of music. It’s in time and in tune but it doesn’t swing and it’s not exciting. I think it’s okay for some types of music, or fixing little clams here and there, but the way we work is pretty natural and we like to keep the takes as they are as much as possible. DRUM! : Do you feel any pressure during pre-production or recording to make an album as commercially successful as your previous work? Rubin: No. It’s really just going for personal greatness. I like to look at the whole thing as an experiment. The fear comes when you feel like, “This is it,” but if it’s just an ongoing process, an experiment, then we’re kind of like scientists in the laboratory. And until we hear it and say, “Oh, there it is,” then we just keep doing it. So there’s no real pressure day-to-day because it’s just an unfolding process. And eventually we say, “Oh that sounds like that’s it. Okay we have that one.” But from my perspective, there’s very little pressure to get anything done. It’s just the process. 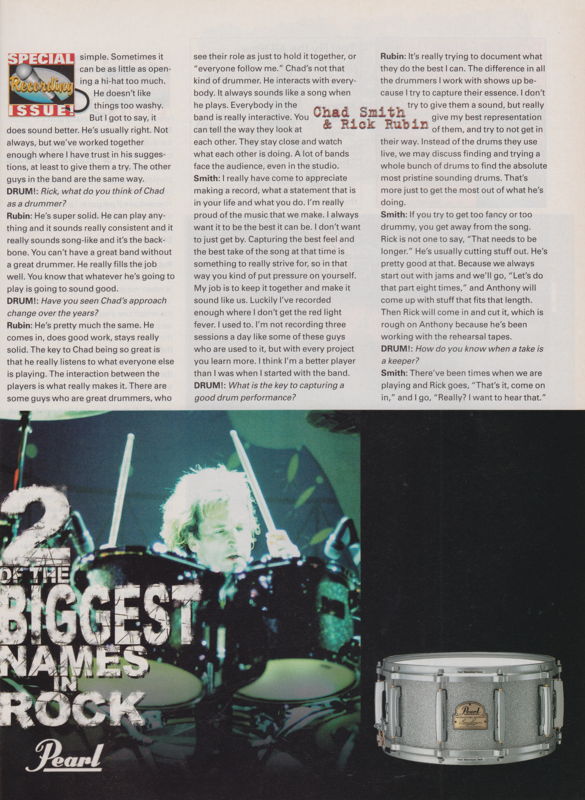 Smith: After Dave [Navarro] left the band and John [Frusciante] came back, no one really knew what was going to happen. 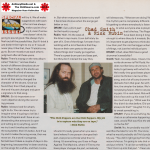 We just started making music again, and we knew it felt good to us, but we had no idea it was going to be our biggest selling record and how successful it would be commercially and artistically. If we had put that record out and nothing happened, it would be, “Oh well, whatever,” and we’d move on. The fact that it sold millions is just gravy on the mashed potatoes. Is that going to happen again? Who knows? You can’t concern yourself with that. You just make the best record you can. You can try to out-guess the public: “We need a slow song.” Things like that we can’t bother with. Whatever comes out, comes out. We pick the best songs and hope people like it. We’re getting better at being songwriters and maturing a bit as musicians and Rick has a lot to do with that, making us think about writing songs, not just jams with raps. Songs have melodies and everybody wants to sing along with a song. We like working that way more and more. No matter what we do – fast, slow, hard, soft – it still sounds like us, which I think is a cool thing.